Want to experience the thrill of skydiving in a funny and challenging way? If yes, hen hold on because keeping in mind your choice we have chosen a game Bacon dive for you to give you time killing and fun reveling experience with unlimited game play. 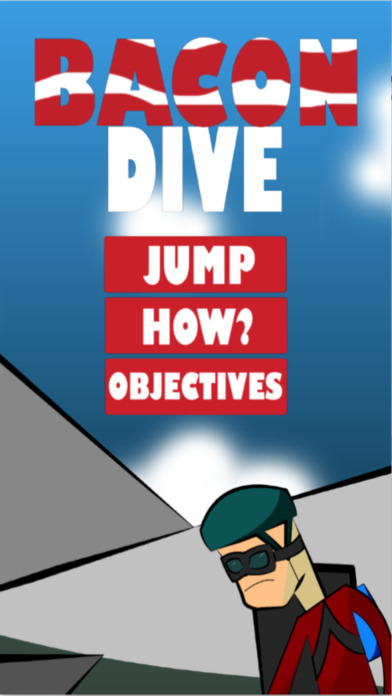 Bacon dive is recently developed for iOS based devices. The game is based on a story of man who love bacon and is dropped from the plane; he is aimed to collect as much bacon as he can through his way. To disturb him from collecting bacon the veggies comes in his way. You have to help this free falling man to dodge these veggies to keep him collecting the bacon, all you have to do is to tilt your mobile in left or right avoid these obstacles as striking them can result in loss of his life. These flying obstacles on the way, makes this action game even more exciting. There are different chances of collecting more bacon like the pigs comes up in the way, striking the will burst these pigs and you will collect more bacons at the same time. The big bonus in the game is the golden grill you have to find it to get bacon mayhem bonus. Bacon Dive is one of the best action games. Download this free from the given link.